Midway through the first half, George Fox trailed Pacific Lutheran 19-9 after a thunderous dunk by PLU's Leighton Kingma. The play forced a timeout by Bruin coach Maco Hamilton, who walked furiously out to the middle of the court and back to the huddle. Hamilton admits that the effort was lacking in the first half from GFU. That resulted in a 46-26 halftime deficit. The second half was a different story, but it wasn't enough as PLU pulled away for the 79-69 victory. "It was a tale of two halves," Hamilton said. "The first half I thought we were lethargic and didn't play with the effort or energy we need, and in the second half we responded. I'm proud of how they played in the second half – it's just unfortunate that we couldn't finish it out." GFU found success in the second half thanks in large part to an effective full-court press. The Bruins forced myriad turnovers and PLU was rarely able to set up a quality look on offense. A handful of scoring runs later, the game was within single digits with about 11 minutes remaining. With 6:45 left, the game was tied at 59. As the energy returned to the Bruins' sideline, the energy in the building grew more and more hostile toward the officials – particularly from PLU fans. The game wasn't perfectly officiated by any means, and there were plenty of missed and poor calls on both ends, but some of the conduct bordered on harassment as the game became more competitive. Both teams picked up technical fouls throughout the course of the game, including a double technical assessed in the early part of the second half after an and-one led to some back-and-forth jawing between the Bruins and Lutes. GFU took the lead for the first time in the game, 61-59, with 6:17 to go. From there, the lead changed hands a few times before PLU regained its stranglehold on the contest. As the Bruins' offense reverted to its first half struggles, PLU got out on the fast break and played its brand of inside-out basketball. Hamilton said the Bruins came up short due to the energy expended clawing back from a significant deficit. If they hadn't put themselves in that situation initially, he added, they might have had a better chance. "When you spend so much time getting back into the game, it's hard to hang on once you're back in it," Hamilton said. "You get to that point and you exhale, then it's even tougher. PLU made the plays down the stretch and we didn't." An 8-0 run after GFU took its first and only lead of the game sealed it in favor of the Lutes. From there, it was a slow burn as Hamilton's team was forced to play the foul game. PLU hit its free throws and that was that. Since the Bruins got off to a surprising 10-3 start, they have lost six of eight and sit at 12-9, 6-6 in the Northwest Conference. It's not getting any easier for the Bruins, either, as they face No. 2 Whitman and No. 15 Whitworth on the road Friday and Saturday. 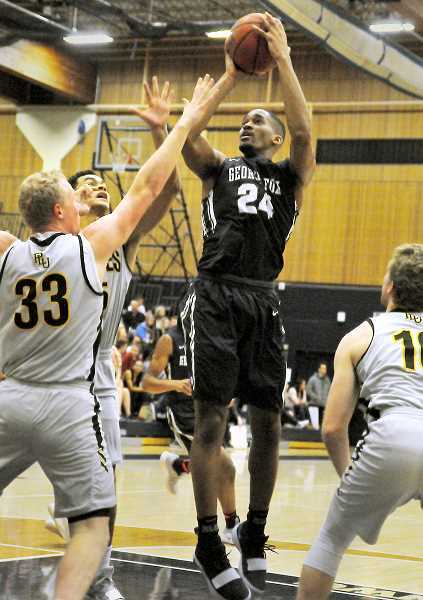 With four total games remaining on its regular season schedule, a run of upsets in the conference tournament appears to be GFU's only shot at a tournament berth. The odds are steep given the talent in their conference, but the Bruins have played top teams close before. Right now, though, GFU is trying to find a way to put together two wins in a row. The team is struggling down the stretch of the season and hovering around the middle of the Northwest Conference standings. Hamilton said he is searching for the answers as to why the season plateaued at this point. He is hoping the team can turn it around when it matters most and pull off a few signature wins along the way. "We'll continue to be thoughtful with how we're processing where we're at," he said. "We'll have intentional conversations as a coaching staff and as a team. We're a very honest group here and the hope is those conversations will help us figure it out."